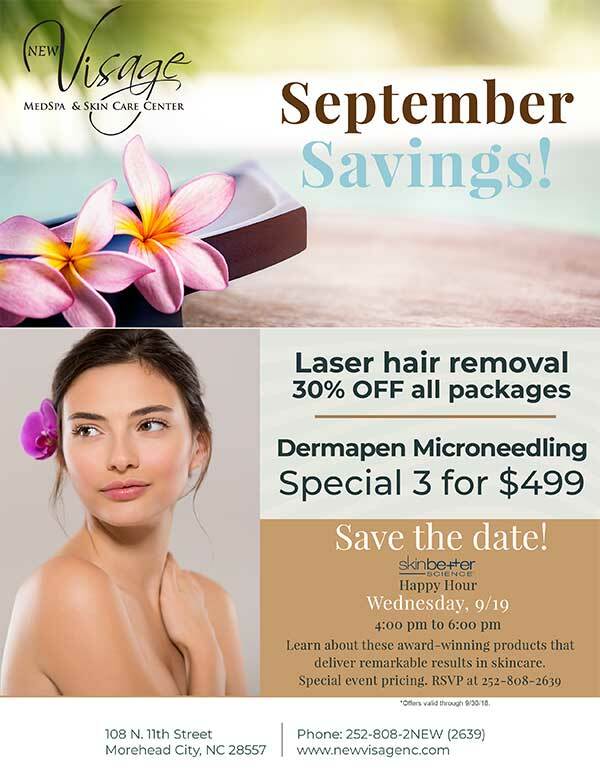 September Means Special Treatment For You! School is back in session and football games are being streamed on Saturdays! The calendar may not officially say fall yet, but summer is certainly on the way out. The summer months can be extremely damaging on our skin. From long days in the sun, busy schedules spent traveling, and excess sweat from all the heat; our skin gets the short end of the stick. Fortunately, September is the perfect time to correct all the damage and with New Visage’s September specials, you can save while you’re at it. Let’s kiss summer goodbye and get you fresh faced for fall! Removing unwanted body hair has always been a time-consuming and overall headache of a process for women. Whether you choose shaving or waxing, the process never seems to eliminate the problem altogether. Laser hair removal is your one-stop, non-invasive approach that leaves lasting, permanent results. This month at New Visage, we are offering 30% off all laser hair removal packages. This deal is a great way to save on an investment that can last a lifetime! Learn more about the benefits and what the procedure entails here. Don’t forget to Save the Date for SkinBetter Happy Hour! Our SkinBetter Happy Hour is an event you won’t want to miss. Call your girlfriends and mark your calendars for Wednesday, September 19 from 4-6 p.m. Join us for a fun afternoon of cocktails and learn about award winning products that deliver remarkable results in skin care. Special pricing will be offered! This is a happy hour that leaves you looking as good as you feel! RSVP by calling 252-808-2639! These offers are only valid through September 30th, so if you are ready to rejuvenate your skin and look great for fall, contact us today! You can also book one of our many medical spa or spa service treatments, all by calling 252-808-2639. For the latest news, tips and tricks, and all things skin care, be sure to follow us on Facebook, Instagram, and Twitter. Previous Post: Hot August Savings On The Services You Love!